This article is not relevant for R80.x. When text is copied from advanced text editors (e.g. Microsoft Word) and pasted into the SmartDashboard in a rule, certain non-ASCII characters are pasted as well. These non-ASCII characters (such as "à", "Ö", "ç") will cause the policy installation to fail with various errors like "Internal error", "Load on module error", etc. 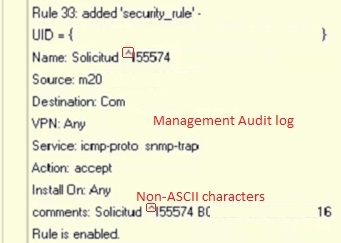 Check Point provides a special Tool for checking Check Point objects and rules for non-ASCII characters that detects the problematic rules in a more convenient way. The tool will scan the $FWDIR/conf/rulebases_5_0.fws file and when it finds the rule with an invalid name, it adds the comment in the string --INVALID RULE NAME--. After running the tool open SmartDashboard, search for this string and fix all names. -r - read only mode  it will only print the result of the scan, but won't do any modification to the database. Connect to the command line on the Security Management Server / Multi-Domain Security Management Server. [Expert@HostName]# grep -n -e "name.*(. *" -e "##. *" $FWDIR/conf/rulebases_5_0.fws -o | grep -e "["$'\x80'"-"$'\x9F'"]" -e [[:cntrl:]] -e "##"
[Expert@HostName]# grep -n -e "comments.*(. *" -e "##. *" $FWDIR/conf/rulebases_5_0.fws -o | grep -e "["$'\x80'"-"$'\x9F'"]" -e [[:cntrl:]] -e "##"
Collect a complete backup of the Management Server (refer to section "How to Backup" below). Login to SDB and search for the object/rule name/comments that contains the non-ASCII character based on the above command output. Delete non-ASCII character and then push policy. "OR"
Delete the non-ASCII characters in the relevant lines (refer to the output of the 'grep' command). Save the changes in the file and exit from the Vi editor.